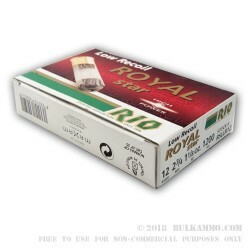 RIO’s long history of providing high quality shotgun shells to the consumer market means they understand a thing or two about adding value. The company, owned by the MAXAM group is among the largest producers of shotshells by volume in the world and the legacy of the company goes way back to Alfred Nobel (of Nobel Peace prize fame), who was the inventor of dynamite, and a thought leader and inventor in the firearms and ammunition fields. 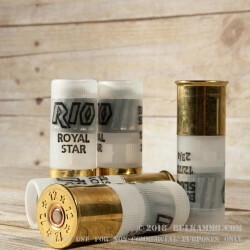 RIO is a high quality, low cost shotshell that offers a good value for the money and this rifled slug is proof of those statements. The low recoil load is a 2 ¾” shell with a rifled slug in the cup that weighs 1 ounce (438 grains). This heavy slug is suitable for big game hunting, personal protection in an urban or rural environment or for target and range work. The lower felt recoil means faster follow up shots in a tactical or sport shooting scenario, and less strain or discomfort when long training sessions take place. This is a 250 round case lot of ammunition that is packaged 5 rounds per box with a case lot being equal to the 50 boxes. 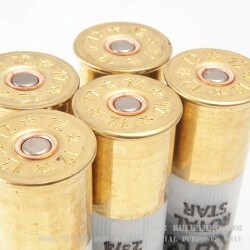 Great ammo at a even better price! Q: Are there additional discounts for higher volume orders? A: No, the prices we offer are the best ones that we are able to negotiate for our customers. 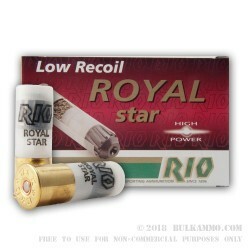 Q: I notice the box says 'Low Recoil' but also 'High Power' - what gives these rounds the high power? A: A 1oz slug from a 12 gauge at 1200fps is pretty powerful, reduced recoil or not. Q: Do you shoot rifled slugs out of a smooth bore barrel or a rifled barrel and if they are shot will they damage the barrel of on or the other? A: Rifled slugs are intended to be fired from a smoothbore shotgun barrel, but are safe and fairly accurate through rifled barrels. No damage will result from either combination. Q: Roughly, at what distance can these slugs be accurate at say a deer sized target? 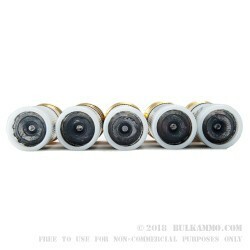 A: With proper sights and technique, these slugs will allow the shooter to take deer at 100 yards. Q: With these clear tubes is it possible to reload the shell? Also, what kind of velocity does tis round have? A: These shells are reloadable, however, you should know that Rio Royal primer pockets are slightly oversized, as they are made to European standards. You can still use American primers, but you'll get the best results with Rio brand primers. 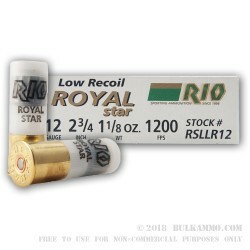 Also, the muzzle velocity for the Rio Royal 1oz low recoil slug is 1200fps. Q: What makes low recoil slugs different from normal loads? Is it just a difference in powder charge and therefore velocity? A: Low recoil ammunition has either a reduced muzzle velocity or a reduced projectile mass. 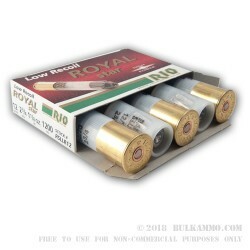 These 1oz slugs are slightly lighter and slower than the maximum of what a 12 gauge shotgun is capable of propelling, but are still very effective. Q: would this help lower the recoil enough so that my wife of 105lbs could handle the 12 gage? A: Using low recoil ammunition will help shooters of smaller stature manage larger firearms. However, some of the greatest increases in control will come from refining technique and stance. Q: Do these wear your barrel out faster than buckshot or regular shot? 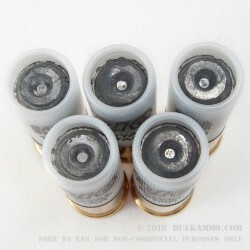 A: No, the lead slugs used in this ammo will not wear out your barrel any faster than lead buckshot or lead birdshot.